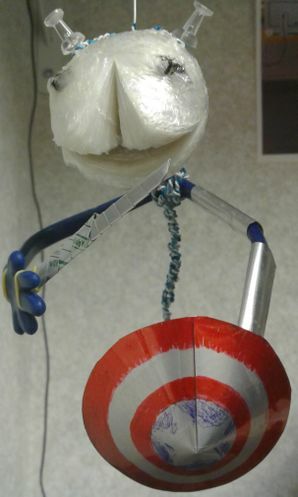 Canptain Tapeball is the horrific creation of RussleJimJams' boredom. He was constructed from a ball of tape, two thumbtacks, some telephone wire, a weird arm thing from a convention, and pop cans. When not called to perform RussleJimJams' bidding, he hangs from a ceiling tile in RussleJimJams' office. This page was last edited on 7 January 2017, at 15:31.